Kefalonia is the largest island among the Ionian group of islands. This large island is located to the west of mainland Greece. The total surface area of Kefalonia is 800 sq.km. It is very close to the neighbouring island of Ithaca. The history of Kefalonia is strongly connected to the history of Ithaca and in fact scientists believe that in the prehistoric times, the two islands were united. A very interesting fact is that Kefalonia is positioned east to a major tectonic fault where both the Aegean and European plates meet. As a result, it has been subjected to numerous earthquakes, only some of which have been recorded so far. A massive earthquake literally destroyed most of Kefalonia in 1953, sparing only the village of Fiskardo on the north. As for the geography of Kefalonia, it is a mixture of both towering rugged mountains and fertile plains. The highest peak is Mount Ainos, rising at 1628 meters above the sea level. From north to south, there lays Gerania Mountain range covering a span of 5 km. Kefalonia also has dense vegetation and there are plenty of wonderful beaches and natural caves that can be seen. 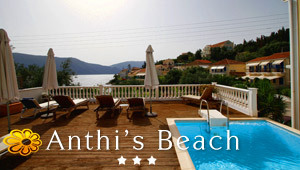 Among the beaches, Myrtos is famous for its spectacular natural beauty surrounding the beach area. It is a major tourist attraction and has ranked fifth in the world for its scenic beauty. Other popular beaches in Kefalonia include Antisamos, Xi, Lourdas and Emblisi. The general characteristic of the beaches in Kefalonia are the sandy shores, the crystal water and the wild, rocky landscape around them. The inland of Kefalonia is rather mountainous but very green. Some trekking paths run the lush forests and pass through picturesque villages. There are about 10 major touristy villages on the island and several beaches with tourist facilities. Argostoli is the capital city and consists of a population of 14,000 inhabitants. Nearly one third of the population resides in the capital. In total, Kefalonia has about 40,000 permanent residents. Kefalonia map View the map of Kefalonia with the main villages, beaches and sightseeing. Also, location of the port and airport.